"God's Love We Deliver Signs" by Normadeane Armstrong Ph.D, A.N.P. This is a set of two identical God's Love We Deliver signs used during the 2017 Pride parade (the New York City lesbian, gay, bisexual, transgender parade) which took place on June 25, 2017, in New York City. 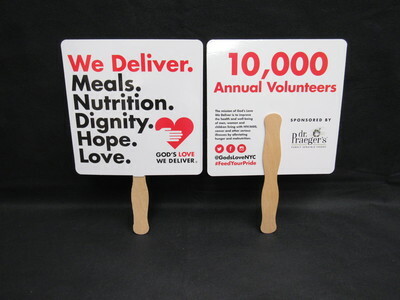 The signs were produced by God's Love We Deliver an organization with the mission of improving health and well-being of men, women, and children living with HIV/AIDS, cancer, and other serious illnesses by alleviating hunger and malnutrition. The signs feature the social media links @GodsLoveNYC and #FeedYourPride as well as the emblems of Twiter, Facebook, and Instagram. The mission statement of God's Love We Deliver was printed on the signs along with their sponsor's information. Note: Photograph shows the front of one sign and the back of the other.